The Des Moines Buccaneers got out to a 3-0 start and withstood a third period rally by Lincoln to beat the Stars in Des Moines, IA by a score of 5-3. The loss was Lincoln's third in a row. With the loss, the Stars fell to 3-6-1 (7 points) on the season and are still in last place in the USHL western conference, three points behind the 7th place Omaha Lancers. Click here to view the current league standings. Another slow start for the Stars allowed the Bucs to jump out to a 1-0 lead less than three minutes into the first period thanks to a powerplay goal by forward Mark Petaccio. That lead increased to 2-0 at the halfway point of the first period after an even-strength goal from Bucs forward Joe Widmar. Bucs took that 2-0 lead into the first intermission. Shots were even at 13-13 through twenty minutes. In the middle stanza, the Bucs added one more goal to take a 3-0 lead going into the second intermission. Shots were 16-11 in favor of Des Moines in the second period. Through forty minutes, I thought the Bucs were the more aggressive team with and without the puck. The Stars had some good offensive chances, but overall I thought Des Moines was the stronger team. As we've seen quite a bit this season, the Stars wait until they are down a few goals before they wake up, and that was the case in the third period. Lincoln goals from Michael Gillespie, Patrick Polino (PP), and Dominick Sacco actually brought the Stars to within one goal with 4:54 remaining in the game. Bucs led 4-3 at the time and the Stars seemed to have all of the momentum. However, with less than a minute remaining, the Stars were unable to get the puck out of their own zone and it cost them. Des Moines scored with 35 seconds remaining to complete the scoring and shut the door on Lincoln's comeback attempt. Buccaneers forward Mark Petaccio finished the game as the #1 star with 4 points (2g, 2a). Petaccio was a player I noticed immediately at the 2014 USHL Fall Classic in Sioux City. At the time, he was playing for the Tri-City Storm. He's a big kid who plays with an edge and was putting up points at the Fall Classic. At the time I remember thinking to myself, "this kid is going to wreak havoc in the western conference. I wish we had him in a Stars uniform." Surprisingly, the Storm traded Petaccio to the Bucs before the regular season started. Petaccio is a '94 (overager), so I'm assuming the Storm just didn't have room for him. Stars goaltender Cam Hackett stopped 42 of 47 shots in the loss, while Bucs netminder Ryan Ruck stopped 36 of 39 for the win. 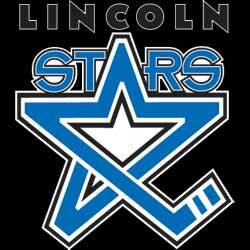 Lincoln finished 1-for-5 on the powerplay while Des Moines went 2-for-4. Special teams certainly hasn't been "special" for the Stars so far this season. Patrick Polino's powerplay goal in this game broke a 0-for-21 snap on the PP for Lincoln. No where to go but up in terms of productivity from the PP and PK units. I mentioned this on Twitter last night in the waning moments of the third period, but I'm not sure why this Stars team waits until they are down 2-3 goals before they start playing at the level they are capable of. They are a better team than their record indicates, I'm pretty certain of that. Defensively, this team can play a whole lot better. You aren't going to win too many games when you give up 47 shots on goal, and average 36 shots against per game. Lincoln has given up at least 5 goals in four of their last five games played. It will be interesting to see how this team responds this upcoming Tuesday when they face the Bucs again, this time at the IceBox. We'll know a lot about their character, for sure. I would expect them to play a 60 minute effort and get a little payback. Don't forget that the game against Des Moines this Tuesday at the IceBox is Military Appreciation Night. The Stars will be wearing special jerseys designed by trainer Corey Courtney to commemorate the event, and a silent auction will be held during the game for the jerseys. Click here to read more about that. I felt like the goaltending was going to be more impressive than it is showing to be this year. I'm with you on the slow starts, not sure what that is about, but you hope they get that out of their system and quickly. It has to be hard for these guys to get in a groove with all of these one game weekends, but thankfully things pick up this week. I'm not sure it's fair to pin blame on the goaltenders at this point. They aren't getting much help at all. You aren't going to find too many goalies in the USHL who thrive when the team in front of them gives up 36 shots per game. It's still early. This team hasn't been able to get into a rhythm the last 3 weeks or so due to the scheduling quirk, as nutz4puckz said above. Hopefully they'll start playing better when they are getting 2-3 games in every week.